Board of Public Works members Treasurer Nancy Kopp, Gov. 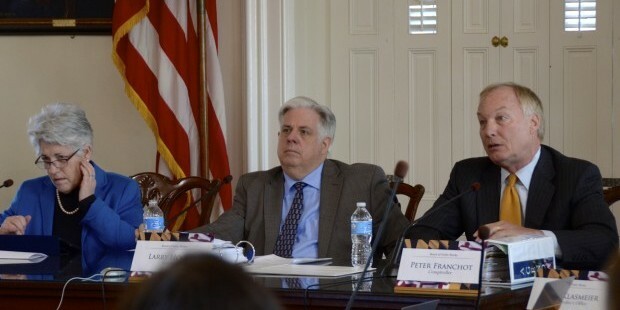 Larry Hogan Jr. and Comptroller Peter Franchot meet in Annapolis. Maryland’s system of contracting for services through competitive bids is in shambles. It has been that way for years — and is getting worse. It’s an embarrassment to taxpayers. Yet a long list of procurement debacles hasn’t been enough to spur sweeping reforms. That seems likely to change, thanks in part to a royal screw-up on a food-service contract that all three members of the Board of Public Works strongly denounced last week. Gov. Larry Hogan Jr. described the badly botched prison-food procurement as “one of the most disgraceful displays of mismanagement” he’s seen in his long business career. Comptroller Peter Franchot, a persistent but lonely critic of these contracting disasters, called it “the most troubling procurement” in his eight years on the board. Nearly every month, the board hears nightmarish tales of state contracting efforts gone awry, of contractors who submit lowball bids only to seek costly add-ons later, of inept procurement officials who misapply contracting rules, tilt the playing field, make a mess of the bid-and-award process or fail to use common sense. Hogan and Franchot earlier this year repeatedly skewered University System of Maryland officials for ineptly explaining cost overruns and excessive spending on university capital projects. Now the prison-food contract horror story has led board members to the brink of action. It’s a tale of stupidity by corrections officials under former Gov. Martin O’Malley. It’s a tale of a contractor using the threat of cutting off food deliveries to Baltimore inmates to secure a whopping 54 percent boost in state payments. It’s also a tale of misleading statements that now are coming back to haunt the winning bidder. Franchot also should have asked the governor to appoint a blue-ribbon panel of outside experts to study recent procurement disasters and recommend ways to fix a dysfunctional system. In short, here’s what happened on the prison-food contract. State corrections officials made the inexcusable mistake of erring on how many meals are served to Baltimore prison inmates each day. This should have been basic math, backed up by recent meals-per-day figures. Yet corrections officials requested that contractors submit bids for serving 23,000 daily prison meals. The actual number should have been closer to 15,000. That’s a huge difference because the contractor is paid on a price-per-meal basis. The incumbent contractor, based on its seven years of experience at the Baltimore prisons, estimated it would cost $89 million over three years to fulfill the food contract. The other bidder came up with a stunningly low figure of $37 million. That’s a whopping difference — a gap in bids so gigantic it should have set off alarm bells. Something was very wrong with the state’s request for proposals (RFP). Instead of catching the mistake early, state prison officials went ahead and awarded the contract to the low bidder, which hadn’t even taken the basic step of inspecting the prison kitchen facilities before bidding. Such naiveté never surfaced when the board, under O’Malley, approved this contract in early January. Instead, the company called itself award-winning and pledged to do a great job. Almost immediately that promise collapsed. The prison kitchen facilities needed hundreds of thousands of dollars in upgrades that the contractor hadn’t figured on. Health inspectors listed 11 pages of required remediation. The vendor was serving nearly 8,000 fewer meals per day and losing $70,000 a week. On Feb. 24, the company informed the state it would stop serving inmates on Feb. 28 — just four days later — unless its compensation was boosted immediately by 53 percent. Faced with the prospect of inmates going without food, new corrections secretary Stephen Moyer had little choice but to give the vendor what it wanted — an emergency, six-month, $6.6 million contract that dramatically jacked up payments to the vendor. Moyer wisely cancelled the original contract award, which is supposed to be re-bid in about six months. Good luck on that one — especially since the department that bungled the first RFP-and-award process is still running the show. Franchot called the winning vendor’s explanations “deplorable.” “You essentially deceived us,” he told the company’s owners last week. But whose fault was it? The state is so culpable that legal action against the winning bidder may not be possible. Who should vet procurement policies? In reality, it is a systemic problem. Actions to revamp and improve the system will speak far louder than angry words of disgust. ← Crazy Nuts for Crazy Richard’s Nuts!